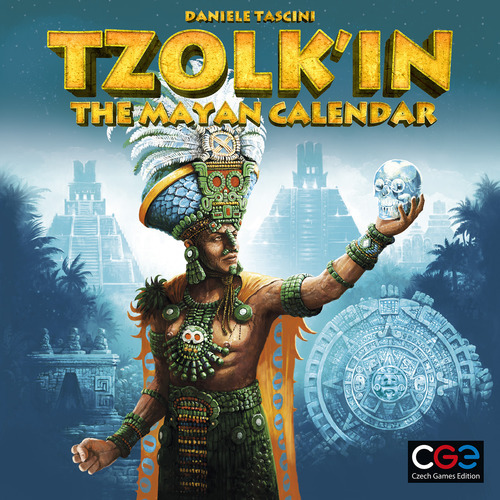 Well, I've been excited for Tzolk'in for at least 6 months since I first saw the fancy video of the prototype with the gears turning. As often happens, Rio Grande Games was late with their shipping date probably due to the complexity of the manufacturing for this game so it didn't arrive till after Christmas. But boy was it worth the wait! I've managed to play a couple games now - 3 and 4-player and I can happily say that this game is more than just the gear-turning gimmick. 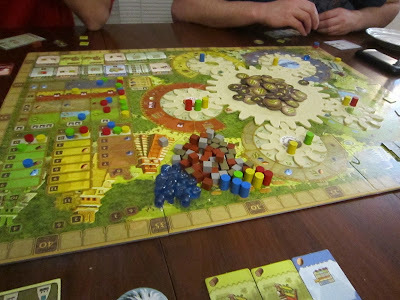 Yes, it really is yet another worker-placement game but it is so tightly put together, so full of strategic options, and so difficult to play well that it shines brighter than any game I've played in the past year. Despite the overwhelming amount of actions, the game is still relatively easy to explain and pick up. Playing it well, however, seems to be very, VERY difficult. The main crux is that as the rounds pass by on the larger gear, the workers you have on the smaller gears progress to different and often more powerful actions and being able to time these actions correctly is tough, tough, tough. I've only played it twice and the game is a bit longer (~2 hours) but the level of depth and variety make up for it and mean that it will be played for years to come. The game seems designed almost to be the bigger, meaner dice-less brother of Stone Age and feels as tense and heavy as a game of Age of Steam. Brilliant and I can't wait to play it again. 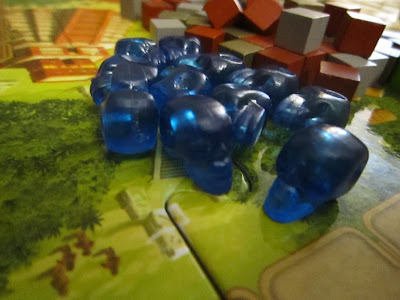 Crystal skulls for the sacrifice.... YES!!!!!!!! Starting wealth tiles so everyone chooses their own starting strategy. Brilliant. Eric, the shipping delay in this case appears to be a problem with the games leaving Germany promptly, which isn't under RGG's control. Copies of the game (along with many other RGG titles) were supposed to be at BGG.CON in mid-November 2012, but by the time the show opened, Funagain (which was selling on behalf of RGG) couldn't even get confirmation that the games had left Germany – which means they probably left for the U.S. at least a month later than they should have.